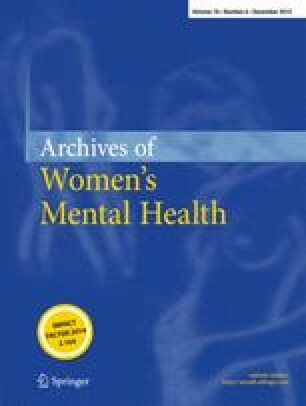 This study examines the clinical profile of women admitted to a psychiatric mother-baby unit as well as change in their clinical, parenting, attachment and quality of life outcomes. Data was collected from 191 mothers through self-report measures at admission and discharge. Change was analysed in terms of Edinburgh Postnatal Depression Scale (EPDS) score, parenting confidence, maternal attachment to the infant and overall functioning. Psychosocial factors impacting on symptom severity and recovery were examined. Most women (64.8 %) were admitted in the first 3 months after birth with an ICD-10 unipolar depressive episode (52.3 %) or anxiety disorder (25.7 %), and 47.6 % had comorbid diagnoses. Improvement from admission to discharge was seen with large effect sizes (≥one standard deviation, i.e. μ) in terms of clinical symptoms (EPDS, μ = 1.7), parenting confidence (Karitane Parenting Confidence Scale (KPCS), μ = 1.1) and attachment to their infant (Maternal Postpartum Attachment Scale (MPAS), μ = 0.9) as well as overall level of functioning (SF-14, μ = 1.9). The majority (73.3 %) recovered symptomatically, and this was associated with increasing maternal age (odds ratio (OR) = 1.129, p = 0.002) and lower levels of psychosocial risk at admission (OR = 0.963, p = 0.008). Improvement in parenting confidence was associated with increasing maternal age (OR = 1.17, p = 0.003). No predictive factors were found for improvement in maternal attachment after controlling for admission scores. In the short term, joint admission of mothers with their infants is highly beneficial in terms of clinical, functional and parenting outcomes, but follow up studies are needed to assess the longer term benefits for mother–infant dyads. The use of an observational tool to enhance our assessment of maternal–infant interaction and some measure of maternal emotional dysregulation—both important mediators of development of secure infant attachment—would also enhance our ability to tailor therapeutic interventions. We gratefully acknowledge Dr Alice Dwyer’s assistance in defining diagnosis by means of file audit, as well as the infrastructure support from the St John of God Health Care, the nurses at the Burwood Hospital Mother-Baby unit and the women and their families who gave their time to participate in this study.